Would Your Employees Refer You? The title to this post should stop and make some business owners question a few things. Things like – I’ve never really thought of my employees as a referral source. I don’t know if my employees know how to refer me, or worse, I don’t know if they know if they would refer me. Or maybe you’re thinking, I wonder if there’s a way to get my employees to refer prospective team members? Your current employees, like your current customers, are more suited to refer, or not refer, your business than any other group. 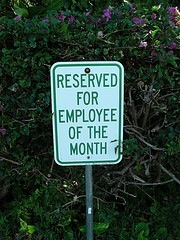 So, would your employees refer you? Do they act as a primary referral source for both customer and new employees? If not, why not? There are really only two reasons that people don’t refer – employee or not. You don’t deserve referrals, and your employees are most often the group that knows this best. Or, you’ve not communicated your expectation referrals and not taken the steps to educate and equip your referral sources – employee or not. So, what have you done to motivate your staff to join in the game when it comes to referrals?